If you've been following my blog for awhile, you know that Fridays often mean comfort food for this veggie chick. And, because I'm currently single, cooking only for one, I can eat whatever I want for dinner... and tonight, it was potato wedges! wedges each. Toss wedges in mustard mixture until thoroughly coated. turning them onto other cut side after 10 minutes. Transfer to a warmed platter, and serve. Potatoes are my comfort food too. I've never tried mustard on them, but it is a good idea for sure! Yum, I wish I had read this earlier! I will just have to save it for another night! I love the idea of Comfort Food Fridays, as I am always wiped out by Friday and ready for the weekend! mmm...these look so good! i've never tried potato wedges with mustard. Potato wedges are great. I like your list of ingredients, which I imagine make the taste perfect. Yummy! These would be great with some Bacon Salt. If you haven't heard about it yet, go to www.baconsalt.com. It's vegetarian so you're taste bacon without the guilt! 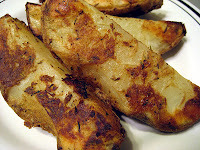 Potato wedges are always delish, these look really good. I'd like some now! Got here via Eat Air....glad I stopped by. I also found this recipe in the NYT's and it has become a favorite of mine. My wife, a vegetarian, is a oven-roasted potato fanatic but does not like oil. Because this recipe doesn't have a strong enough mustard taste by the time it has finished, I simply create a mustard dipping sauce for the fries. It saves on some cleanup as well. I've been experimenting with different methods for crunchy on the outside, soft on the inside. I found that soaking the pre-cooked wedges in very hot water before cooking worked well, but I think the microwave method works better and saves me half the time. I just tried this tonight and they were so yummy! I'm such a mustard freak, and roasty potatoes are always a hit around here... looks like I've got a new project! !